1 Evenly coat bottom and sides of 5-quart slow cooker with 2 Tbsp. Hellmann's® or Best Foods® Real Mayonnaise; set aside. 2 Combine remaining ingredients except chocolate chips in large bowl with electric mixer according to cake mix package directions; stir in chocolate chips. Pour into prepared cooker. 4 Cook on LOW 3-1/2 hours. Turn off heat. Remove insert from cooker. Carefully remove lid and paper towels. 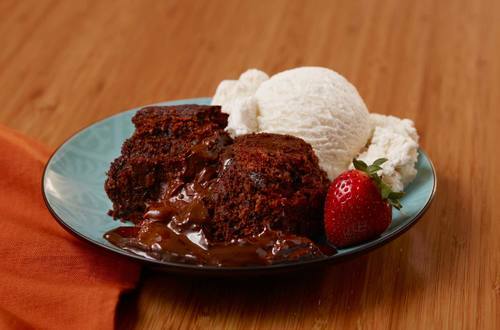 Serve cake warm and, if desired, with Breyers® Natural Vanilla Ice Cream.